Dating to circa 1900, this beautiful Teke Turkmen carpet has a soft colour palette and a square size. Overall, it is in very good pile except for a small area of wear, and this is reflected in the price. Very decorative. size: 2.31m x 2.31m (7' 7" x 7' 7"). 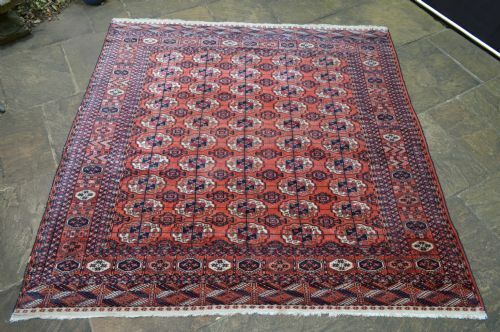 Recently acquired from an old English country house where it had been in the family for many years, this lovely Teke Turkmen carpet has a soft colour palette of madder-red, making it a very easy colour to decorate a room with. The skirts 'elems' at each end are attractively different and overall, the carpet is in excellent condition albeit with a few small areas of restoration. The carpet, like all my stock, has been washed and floor-ready. Size: 2.90m x 2.31m (9' 6" x 7' 7"). 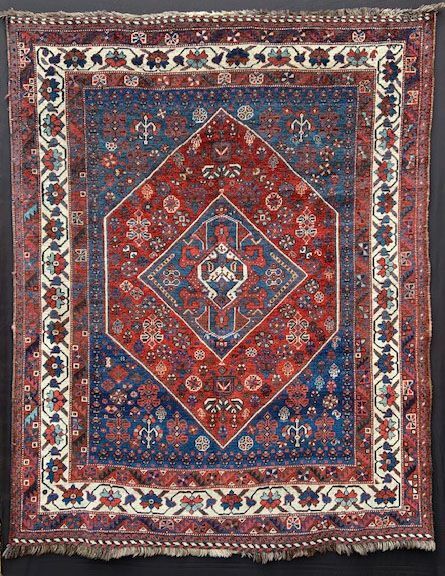 This elegant carpet was made by Afshar nomads in Kerman Province, southern Persia, circa 1870-1880. 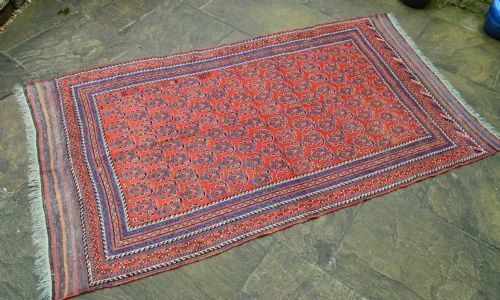 The carpet is in very good overall condition and comprises a 'boteh' design on a madder-red ground - the boteh or flame symbol, originally believed to have originated in Kerman amongst the Zoroastrians. 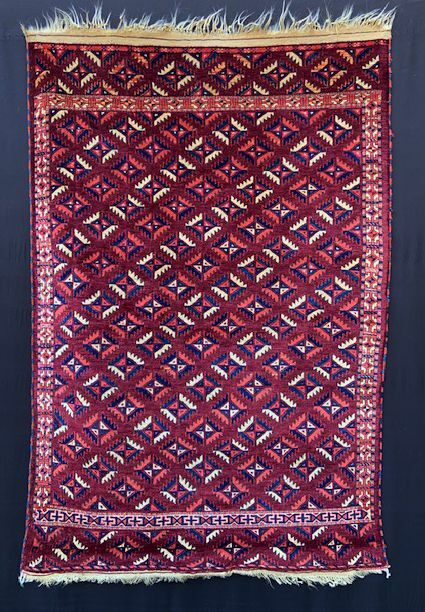 The carpet retains its plain-weave kilim skirts at both ends and I like the depiction of the three small quadrupeds in the lower left side of the red field. Size: 2.60m x 1.45m (8' 6" x 4' 10"). The exceptional 19th century blue-ground prayer-rugs of the Timuri tribes are rare. This one is exceptional. It comprises a stylised 'tree-of-life' in the central indigo-blue field with trees depicted in the hand-panels at the top as well. The skirts, as in the very best examples, are fantastically brocaded and the wool is of the highest quality, sheared once a year from mountain fat-tail sheep. I have written an article on the prayer-rugs of the Timuri in the last issue of Carpet Collector, a magazine aimed at connoisseurs of tribal weaving. In this article, I point out what I feel, are the wrong attributions of Timuri rugs being labelled 'Baluch'. 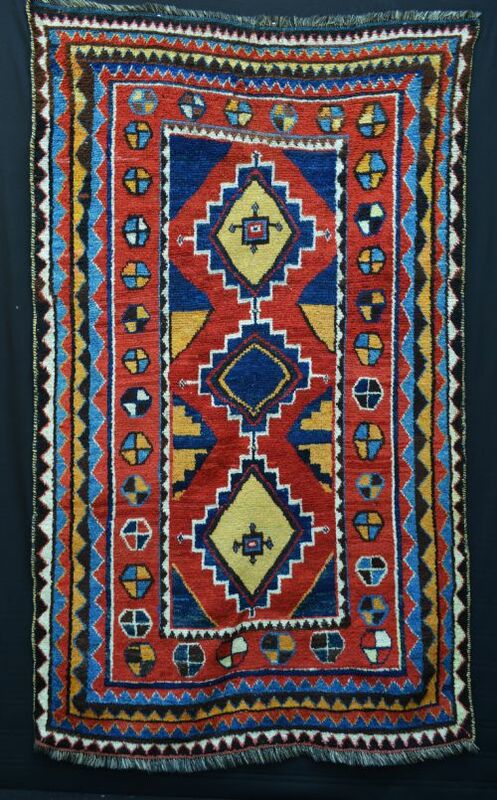 A rare and beautiful wedding rug of the Goklen Turkmen made around 1870. 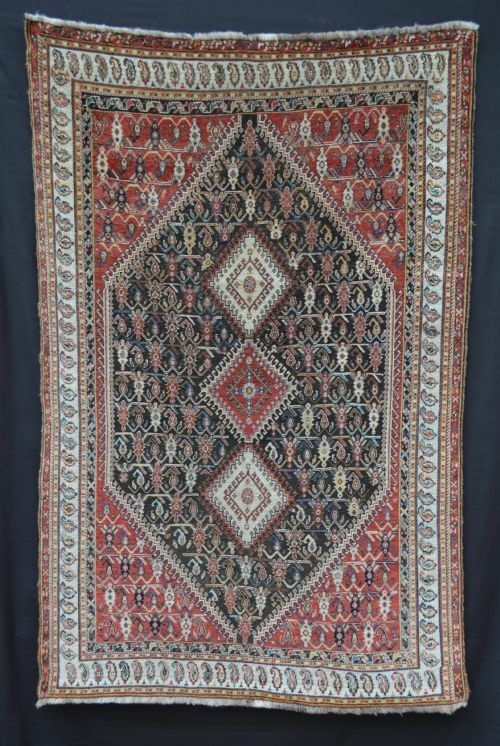 The rug is in excellent condition and depicts a myriad of small 'dyrnak' guls throughout the central field and surrounded by a simple border often found on Goklen weavings. The natural-dye aubergine field has a beautiful palette and the 'elems' at each end have shades of golden yellow. A very collectable little rug made by the Goklen bride for her and future husband to stand on at the wedding ceremony and take their wedding vows. Size: 1.50m x 1.04m (4' 11" x 3' 5"). An extremely handsome rug in near-mint condition, made by the Mahdad Khani Baluch tribe in Khorassan Province, north-east Persia circa 1880. The rug has an unusual compartmentalised design of Turkmen-inspired 'kotchak' symbols and is complete with full plain-weave and brocaded skirts each end. A very collectable rug. Size:2.44m x 1.17m (8' 0" x 3' 10"). 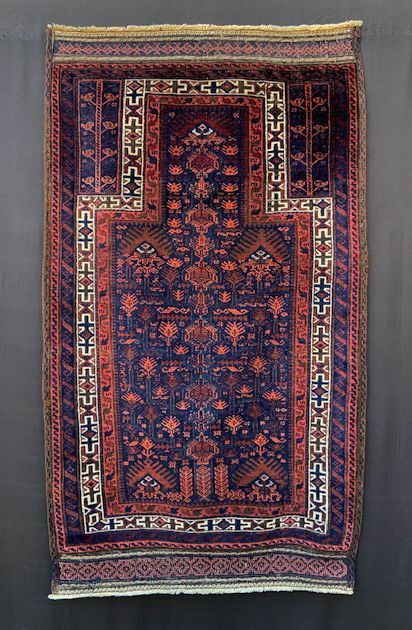 This finely knotted rug of the Qashqa'i nomads was made circa 1870-1880. The overall condition is very good, bar a small amount of mordant corrosion in the dark-brown dyed central field. The design in the central field is elegantly drawn and the ivory border is most attractive with its row of stylised botehs. Size: 1.83m x 1.22m (6' 0" x 4' 0"). Beautiful natural shades of indigo-blue and madder-red dominate this lovely early Baluch. The white flowers in the indigo-blue field represent the nectar-blossom and the main border design powerfully frames the field. Typical for early Baluch rugs is the corrosive brown-dye, seen particularly around the ivory minor borders, caused by iron-mordanting of the wool. Size: 2.44m x 1.00m (8' 0" x 3' 3"). 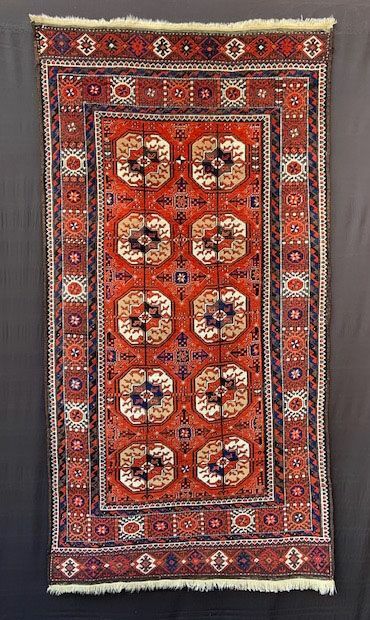 This stunning Baluch rug was made by the Mahdad Khani tribe around 1880. It contains 2 vertical rows of 5 'Tekke' gols - a link at some point or another with this powerful Turkmen tribe or inter-marriage? The rug is in very good overall condition. Size: 1.82m x 0.99m (6' 0" x 3' 3"). Beautiful shades of madder-red and indigo-ble dominate the ground of this lovely tribal rug - made by Qashqa'i nomads around 1900. Particulary attractive too is the clear ivory border depicting a continuous floral vine - symbolically representing the eternal cycle of life. The central lozenge - peculiar to the Qashqa'i - represents the Qashqa'i scorpion. The rug is in very good overall condition. Size: 2.00m x 1.60m (6' 7" x 5' 3"). Old gabbehs are rare and particularly in good condition. They were heavily used by the nomads for everyday rugs in the tents and for use as blankets during the long cold nights. Therefore few of this age survive and today have become very collectable in the world market. 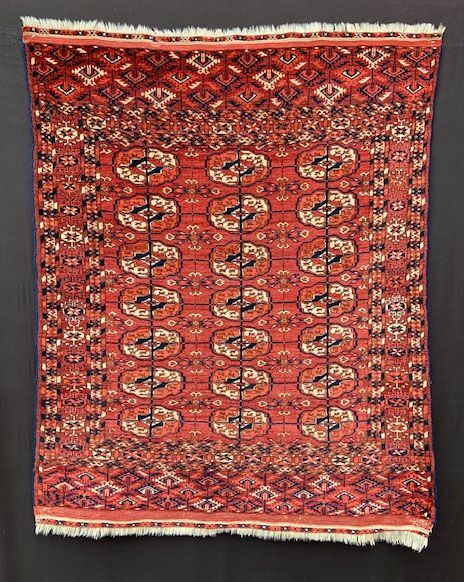 This wonderful old gabbeh, made by Luri nomads in western Persia circa 1890-1900, has beautiful soft, lustrous wool, all vegetable colours and with a bold geometric design. The use of sky-blue in the outer minor borders is particularly attractive. Size: 2.10m x 1.28m (6' 11" x 4' 2"). 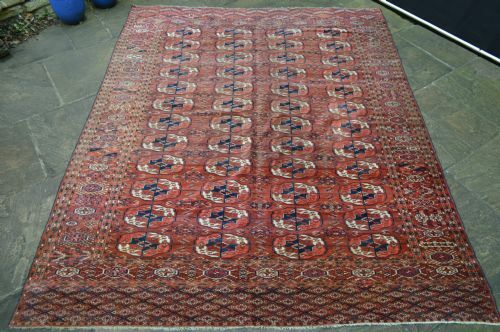 A charming little Teke Turkmen wedding rug made circa 1880 and in very good condition bar a small number of minor repairs. The rug retains its original flat-woven 'elems' (skirts) with an additional band of knotted-pile within the plain-weave at each end - an attractive finish which I suspect tells us how important this little rug was to the young weaver who made it. 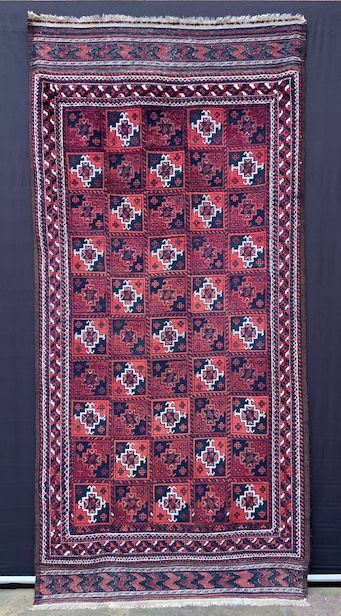 Small, square rugs like this one were specifically made as part of the bride's dowry and was used at the wedding ceremony for the bride and groom to stand on and take their marriage vows. Size: 1.27m x 1,02m (4' 2" x 3' 4").